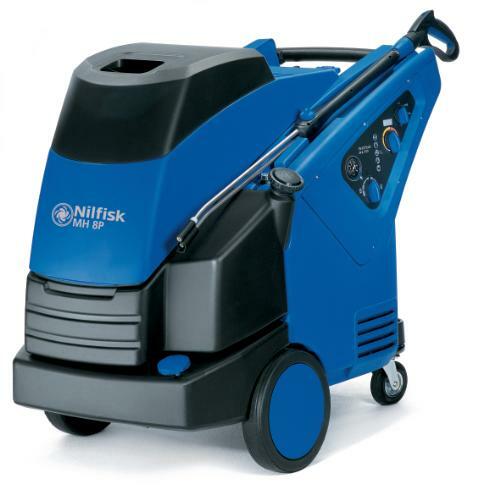 The Nilfisk MH 8P hot pressure washer is a tough and efficient, 3-phase machine with a large volume pump producing Water flow rate (l/m) of 33.3 at 180 Bar pressure. This is a large machine which can be moved but is not ideal for a mobile worker. “Red spanner LED flashing” Contact us for a service. “No detergent” Inspection of detergent system required. “Blowing fuses” Mach ine inspection required. If you’re in Bristol and need a service or repair on your Nilfisk MH 8P call, email or drop-in to our Bristol service and repair centre.